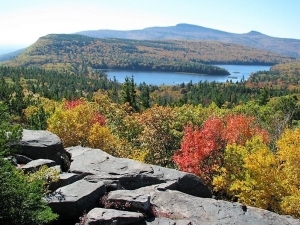 Sunset Rock is a sizable boulder, lying at the top of a sizable ledge of sandstone which overlooks North Lake and one of the Catskills most memorable views. It’s another one of those locations where all the personalities of the Hudson River School came to look and often to paint. Not surprisingly Thomas Cole got there first and, not surprisingly, all of the rest of them followed. We like Cole’s view done in 1843. 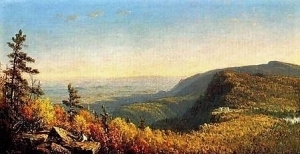 Jasper Cropsey followed suit in 1855, and we are very fond of the canvas he did there. Our favorite is one done by Sanford Robinson Gifford. You will have no trouble finding these and many more online. The view here is grand, even by standards set in the Catskills. You stand next to Sunset Rock, or better still, climb up on it and gaze to the south. To your left is the expanse of the Hudson Valley. Out there you can see the Shawangunks as well. More immediately, in front of you are North and South Lakes. South Mountain rises above them. You have to imagine what is lost: The Mountain House Hotel and the Hotel Kaaterskill once were both clearly visible from here. In the far distance you can sense the presence of Kaaterskill Clove far more than actually see it. Above the Clove you can observe both High Peak and Round Top. Hikers come to Sunset Rock at all times of the year and they are always rewarded with a variety of scenic images. Everybody’s favorite season is at the height of the fall colors, but every time of the year pays dividends to the avid hiker. In short, if you have not gone there – you must! Our very first visit, together, brought us a strong sense of what the glaciers had done to shape this view. Earlier chapters in this series have described the formation of the two lakes down below; this visit will focus on the glaciers descending and flooding in from the north. Are you interested? If so, you are likely to take the yellow trail when you are coming to Sunset Rock. 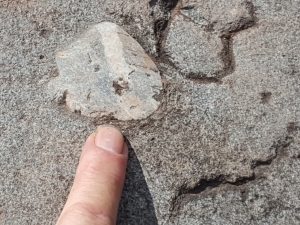 You need to have a sharp eye and you need to know exactly what to look for, but the signs of glaciation are to be found on this trail. What those signs speak of is the immense weight and power of the glaciers that were once here. Contact the authors at randjtitus@prodigy.net. Join their facebook page “The Catskill Geologist.” Read their articles in the Mountain Eagle and Kaatskill Life.